Be careful who to trust. There are chances that things will go wrong if you depend on unknown traits too much. Rely only on people who have already proven themselves to you. Even very weak players could get strong hands and every once in a while, even the resident bluffer of the table will get strong cards. Several players simply cannot be trusted at all. There are chances that things will go wrong if you depend on unknown traits too much. Making quick decisions about players before actually having enough time to watch them properly could cost you a lot. Always take time in studying brand new players before making any rash moves. Rely only on people who have already proven themselves to you. Whenever players, who have shown nothing but conservativeness and care, raises unexpectedly, take heed. It would be smart to fold if your hand is mediocre. Although they might be bluffing, that probably isn’t the case. Be confident that they have calculated each of their moves with tools like player style, pot odds, and position. Instead of going head-on with these rocks, save the bet and give it up. Don’t be shy in things that you do today. However, do not be pushy when going after things that you want, either. A fine line exists between modesty and arrogance. The poker lesson here is clear: do not let table bullies push you around, but do not challenge them, either, if you have nothing to challenge them with since this could prove to be expensive on your part. Take heed of people today that have never supported you before, but are suddenly enthusiastic to help you out now. Chances are that they have ulterior and selfish motives behind their façade. This poker lesson is also very clear: quiet and nondescript players have suddenly turned into chatterboxes and want to become your best friend. Take heed. You might be getting set up through the development of false friendship. They might hope for you to stop raising whenever you hold extremely strong hands. On the same note, they may be planting seeds of protection for their bluffs. Since you have become good friends, they hope that you will think they would never bluff you and that when they do, you will simply fold. Focusing on self-interests to be detrimental to others today might give out temporary gains, but these people will ensure that you never get another edge in the long term. This horoscope goes well with poker’s check-raising lessons. Sometimes, check-raising might seem like the ideal way to play hands, but players aren’t going to fall for this consistently if you do it too much. As a matter of fact, frequent check-raising will create more enemies and trouble than it is actually worth. Check-raising could actually cost you much more in bets in the long term than you could possibly gain in the beginning. If you tick players off, they will play you and make it hard for you to maximize any profits whatsoever. Check-raising comes with a proper place and time. In general, it is driven by position at a hand’s final round of betting and calculated to add two bets to winning pots. Poker lessons seem to exist in everyday life wherever we turn and it is only right since sitting down at poker tables simply lets one person practice his skills in life. 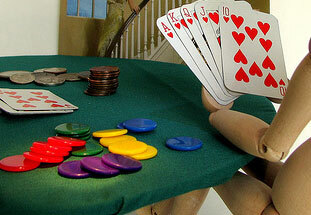 As life is lived a day at once, poker is played a hand at once. When hands get screwed up, all you can do is try again.